Copyright ©2012 by Paul Niquette. All rights reserved. n 2012, a certain puzzle-master moved from Sunnyvale in California to Jugon-les-Lacs in France. 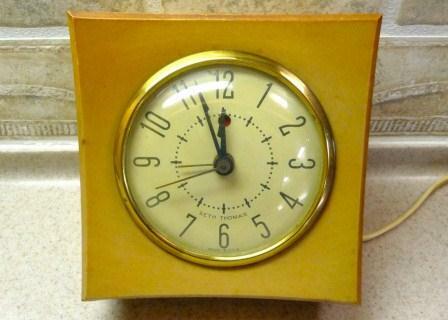 While unpacking his household belongings, he found two favorite art deco clocks. 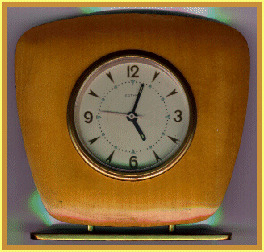 One clock was featured in the Hand over Hand puzzle. Although it is old, the mechanical movement has been improved with battery-powered, quartz-crystal technology and is thus quite accurate. The puzzle-master was scheduled for his first French lesson at 10:00 AM the following morning. The electric clock below has an alarm feature. While preparing to turn in just before midnight, he set the alarm for 9:00 AM. What time did the puzzle-master show up for his lesson?